So what's the deal with chalet hosting? Chalet hosting is a juggling act: one minute you’re cooking up a three-course meal, the next you’re scrubbing toilets, and then before you know it, you’re hosting a dinner party in your freshly cleaned chalet. You'll be responsible for linen ordering, stock management, sauna or hot tub maintenance, customer service and much more. In short, a chalet host is responsible for everything involved in providing a fantastic experience for your guests. what do seasonaires get up to on a season? This is the most important part of your season and where you will be spending the most of your time. Don't forget that without the job, and without your guests, none of the rest of your season could happen. If you embrace the workload and enjoy the time spent with guests, hosting a chalet is incredibly rewarding and a huge amount of fun. Depending on which ski resort you end up in, the nightlife can be a huge part of your season. From Austria's apres scene, to France's club nights or Italy's friendly local bars, it's worth finding somewhere to let your hair down and socialise with the other seasonaires in resort. Working with a hangover might become something of a habit - but a night out before changeover can really mess up your week! The big draw of being a chalet host is that you get lots of time off to ski or snowboard. Unlike many other jobs, you're free to spend almost every day, between 11am - 4pm, cruising pistes, hitting the park, laying down some fresh lines, or just enjoying spending time with your friends, if you have the stamina! Even if you've never skied or boarded before, a ski season is the perfect place to learn. Wherever you are working, there will be many opportunities to try new things. For the adrenaline-hungry you might find yourself ice-climbing, parapenting, skidooing, or even hurtling down a bobsleigh track. Those wanting a quieter life will find most ski resorts offer spas, swimming pools, cinemas and yoga classes. And with all of the work, skiing and partying - you might find that an afternoon nap becomes your favourite new activity! 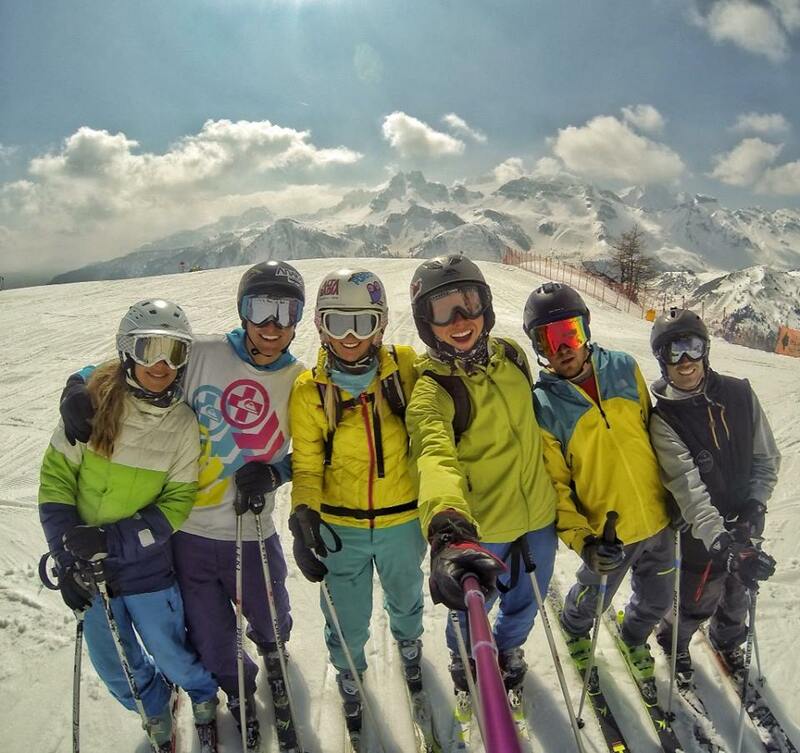 Typically, ski companies offer their staff one full day off a week - although this can vary, and some companies are introducing two days off for their chalet hosts. This is the only time in the week that you don't have to work, so use it wisely and treasure it! Some seasonaires take the opportunity to make first lift, enjoying freshly groomed pistes and the chance to have a big day out. Others prefer to lie-in, and enjoy a lazy breakfast. If the weather's bad, you might choose to party the night before, happy to spend the rest of the day sleeping it off (isn't that right, Steve!). 07.00 - 09.00 Some hosts will collect fresh bread from the bakery, while other companies have it delivered. Get into the chalet early and get cracking straight away - clear down any mess from the night before, make your cake for afternoon tea, prep food for dinner service, and cook and serve breakfast. 09.00 - 10.30 Clear up breakfast, finish your dinner prep, and then it's time to clean the chalet's kitchen, communal areas, and light cleaning guest rooms and bathrooms. 10.30 - 11.00 Lay out your afternoon tea, get the dishwasher on, empty the bin, and then you're done until dinner! 17.30 Back in the chalet, and it's time to get cracking with cooking dinner. Clear down any plates and cups left out from afternoon tea. 18.15 If you have kids in your chalet this week, then now is the time to serve High Tea. Usually a simple two-course meal. 19.00 Some companies serve canapes every night. Make sure you get the table set too, and start thinking about plating up starters. 19.30 - 21.00 Depending on your companies preference, you will be serving dinner at 19.30 or 20.00. It normally lasts around an hour and a half, and you may be expected to eat with guests. Don't forget to stay on top of the washing up, and the upcoming courses. 21.30 Clean down the kitchen - make sure it's spotless for the next morning. Some hosts like to clear the dining table, whilst others leave it until the next morning. Empty the bin, put the dishwasher on, final mop of the floors, and then it's time to head out! Most chalet companies use an online ordering system, where your food is delivered to your chalet (very handy!). This means that you will have to fill in and send off your food order a couple of days before it is delivered, which might involve spending an extra hour or so at work - checking the stock in your cupboards and filling out your order. If you have ordered your food online, it will be delivered to your chalet several days later. The delivery can arrive any time between 9am and 1pm depending on your location in resort (although it tends to arrive at a similar time each week). You will have to wait in for the delivery and then put all your food away before you can head out on the mountain. Don't forget to give your delivery driver any leftover cake you have lying around - it's always good to keep them sweet! If you don't have a food delivery service, you will have to pick up your food in person. This will usually involve heading down the mountain to one of the larger supermarkets, or selecting food from your company's central storage area. If you are driving down the mountain to shop, this may take several hours in total. You will have to put all your food away in your chalet when you get back. Medium to large companies have a weekly team meeting, which is normally scheduled about an hour before the start of evening shift. You may have to do a bit more food preparation in the morning in case the meeting runs over. Normally on a Saturday or Sunday, this is the big one: the day when one group of guests leaves and the other arrives. When you first start out as a chalet host, it is not unusual to be working a 14 hour day without a break, but as you get better, you should be able to find time in the middle of the day to relax and reboot before the next group turns up. On this day you will be serving breakfast, seeing off guests, stripping linen, cleaning the chalet from top to bottom, remaking beds, preparing and cooking dinner, liaising with your managers or guests about their ETA, greeting new guests, taking them to the ski shop, serving dinner, giving a welcome speech and answering any questions your new guests might have. You will not have time to ski on a changeover day. Exhausting? Yes! Worth it? Absolutely! Obviously Christmas Day only happens once a season, and you are expected to work. Not only this, but your guests will have paid a premium to come to your chalet and have you cook their Christmas Dinner! It's nothing to be scared about though - you will need to spend some extra time over the previous week preparing some elements for the big day, and you will probably work a little longer on the day itself, but it can often be a really fun experience. Most companies encourage their staff to head out on the mountain for at least a little bit on Christmas Day, and your guests are normally in a great mood, and will most likely invite you to join them at the dinner table. Wow! That seems like a lot to get my head around! At first, chalet hosting can seem a bit overwhelming, particularly if you're inexperienced. Our course mirrors a typical chalet schedule of morning and evening shifts, and gives you some real experience, so that you hit the ground running in resort. Fresh Tracks is a week long crash course in Chalet Hosting designed to prepare anyone, no matter what stage of life you're at, to feel confident and clued-in when you get into resort. Not only will you be an epic chalet host, but you'll have such a great time you'll probably want to do it again next winter too! Copyright © 2019 Fresh Tracks Chalet Hosting & Cookery School. All rights reserved. Fresh Tracks Chalet Hosting & Cookery School is a registered partnership.